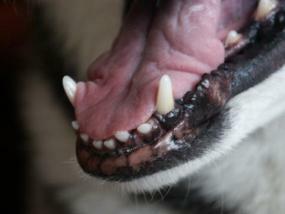 My dog is six years old, and I've noticed his gums are growing and growing. They seem swollen, but not inflamed. I have consulted with three different vets. One told me to keep an eye on this issue just in case it could be a tumor. The other two said apparently it doesn't bother him and it's just gum-overgrowing. His throat is not infected, so I don't know what could have happened. I've mentioned this problem to the breeder I got my dog from, and she thought it might be a food allergy, but he has been eating the same food for the past five years. Well you've certainly been diligent taking your dog to three different vets, but I'm going to recommend you seek the advice of a veterinary dentist. The condition you are describing just might be Gingival Hyperplasia, a fancy word for gum over growth, and the condition is sometimes brought on by certain medications, but it can also occur spontaneously in older dogs. You didn't mention your dog's breed, but certain breeds such as Boxers and Bulldogs can be prone to gum over growth. The gums can actually grow over the teeth, offering bacteria a place to grow, which can eventually lead to gum disease and tooth loss. Surgical reduction of the gums may be necessary, but the gum tissue can still continue to grow back after surgery, so it's not a sure fix. Let the veterinary dentist help you decide the best plan of action.